BEER WARS is a feature-length independent documentary that takes you on a no holds barred exploration of the U.S. beer industry that ultimately reveals the truth behind the label of your favorite beer. Told from an insider's perspective, the film goes behind the scenes of the daily battles and all out wars that dominate one of America's favorite industries. SPECIAL FEATURES include: BEER WARS Live Panel Discussion (featuring brewers and experts from the film), Deleted Scenes and Trailers. Director Anat Baron takes you on a no holds barred exploration of the U.S. beer industry that ultimately reveals the truth behind the label of your favorite beer. Told from an insider's perspective, the film goes behind the scenes of the daily battles and all out wars that dominate one of America's favorite industries. BEER WARS begins as the corporate behemoths are being challenged by small, independent brewers who are shunning the status quo and creating innovative new beers. The story is told through 2 of these entrepreneurs -- Sam and Rhonda -- battling the might and tactics of Corporate America. We witness their struggle to achieve their American Dream in an industry dominated by powerful corporations unwilling to cede an inch. This contemporary David and Goliath story is ultimately about keeping your integrity (and your family's home) in the face of temptation. 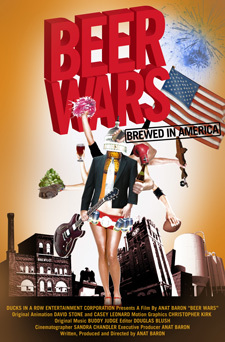 BEER WARS is a revealing and entertaining journey that provides unexpected and surprising turns and promises to change the world's opinion on those infamous 99 bottles of beer on the wall. CNN called the documentary "A David and Goliath story pitting the country's smallest brewers against the largest." "In BEER WARS, entrepreneurialism and opportunity go awry when tainted by greed and a thirst for power." "A trenchant analysis unapologetic in its rebuke of Big Beer, BEER WARS is heartily recommended for patrons already inclined to opt for the local brew at every tap. It will also appeal to patrons interested in craft foods as well as homebrewed beer and wine and others particular about quality."